A cold snap hit Sweden again. Next week forecast is showing a lovely 15 degrees Celsius hitting the south again. From the radio, Elvis Presley - Burning Love, is playing as I finish cleaning up after another week with early days and late nights creating hats. Know that your hats are created with music and a steady flow of great energy. 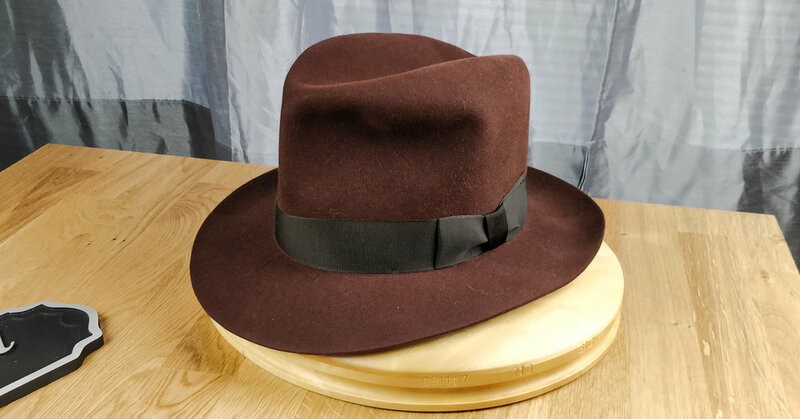 It’s an important work environment and it makes a difference for the finished fedora as it is packed up and leaves the studio with the courier. Last week I talked about courage of owning your own kingdom, being yourself and standing for it. Wear hats that you want. Listen to guidelines but don’t follow strict rules of dress codes. I got special day coming up next week. A day that became my defining moment, a leap of faith if you will, and put me on a new journey as an entrepreneur and on a new path in life. Two posts next week to look forward to. An eventful week and much more productive than the last. Who would have guessed that 16h fasting and working actually works well together. I suppose the focus is different when you are hungry. I Started the week by completing another 30X Beaver blend, ROYAL BLUE Fedora. RAGNAR Fedora to be exact. 5.5 inch (14cm) tall crown complemented with a dark navy blue grosgrain ribbon (cotton/rayon). A bit of purple undertone to that ribbon in certain lights. Another RAGNAR Fedora in EMERALD GRAY got finished at the end of the week. This one is indeed special as I got to use, for the first time, this magenta colored grosgrain ribbon. Also a 50mm wide version. This 100X Beaver fur felt is lighter than any other of my felts and yet much stronger and denser than the rest. The color combination is indeed a favorite, and I wonder if making the brim slightly lighter in color would make it stand out even more. Color contrasts is something that I will be exploring more of and recommend using it as I keep creating your hats. It goes without saying that another LEIFUR Fedora was completed during the week. Lately, a lot of SABLE Brown colors have been requested but the DARK BROWN RUST color is coming back in a couple of orders. The darker version of LEIFUR Lucky is a personal favorite. The felt will bleach with the sun and become this really amazing brown color. I had to place another order for more SABLE Felts in both Rabbit & Hare and 30X Beaver as they are running out. Blocking out (shaping the felt on a wooden form) a couple of more LEIFUR Fedoras next week for next batch of hats. The best part of creating custom hats and not always making the same style and color is the creativity that comes with it. I got the request to make an under welted brim for a 30X Beaver felt in EMERALD Gray. I made a sample a year ago but this time its being done for a client. 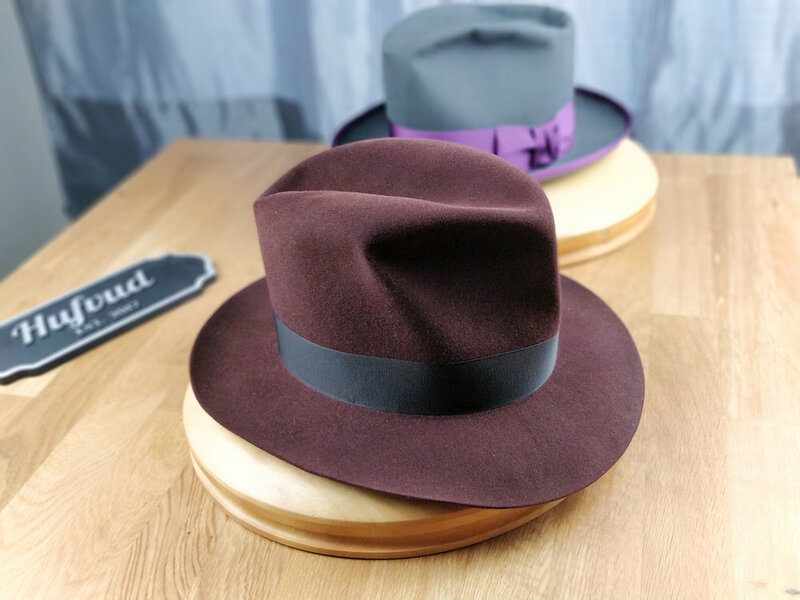 The process, which normally is made with proper tools, was made by hand and ironing into place evenly around the brim. Once this has dried over the weekend I will be able to start shaping out and stitching the edge, yet again by hand. Turns out my gray color thread is not the same as I wished to use and need to run to the store, first thing Monday morning and acquire the correct one. I will cover more on under welting next week as I finish up the hat. Is it the same as binding the brim? My mystery project from last weeks blog is coming together. As I mentioned earlier, it’s a hat that I make as a sample and only during my own spare time. 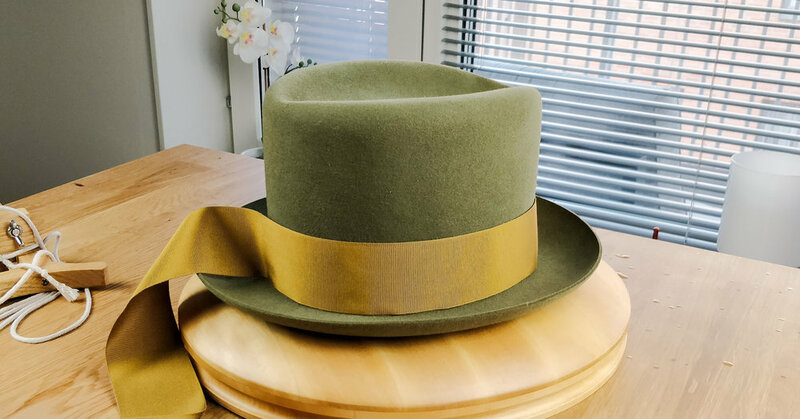 A sage green Rabbit & Hare fedora (Not yet revealed the style) with a vintage green/ gold ribbon. The brim binding will be in a different colors. As I mentioned earlier in the post, contrast colors is on my plate at the moment to explore further. It make a custom hat a bit more unique to have different crown ribbon as for the brim binding. More on this hat next week, but I think I would have to put it on hold for a while as I have three other hats that needs my attention for stitching. Next week will be rather hectic. Got hats with more detailing and more orders from February that must be completed. With the weather getting warmer, the sunlight gives a much welcome energy when working by the window. Should you find terms that I use that you don’t understand, please leave a comment and ask for an explanation. I tend to get too caught up in what I am doing and writing that I forget to explain. Have a great weekend!